Iran has divulged more details highlighting a senior officer from the Islamic Revolutionary Guard Corps’ (IRGC) Qods Force who was killed in Syria last month. The 32-year-old Col. Morteza Hosseinpour-Shalmani (aka Hossein Qomi) was killed during an Islamic State ambush near Jamouna, which is about 37 miles northeast of the US military base of Tanf, near the Iraqi border in eastern Syria. 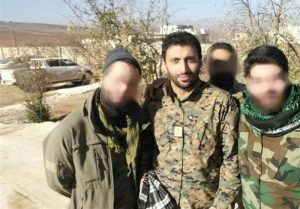 The operations commander of the Iranian-led Iraqi contingent in Syria, Shalmani was leading a unit of Seyyed al Shuhada Brigades which included Iranian-embedded soldiers [See FDD’s Long War Journal report, IRGC-controlled militia accuses US of strike to hide Islamic State raid near Syrian border]. “His presence was so effective that when commander [Qassem] Soleimani heard the news of his martyrdom, he said that ‘a big harm has been inflicted; I wish I was martyred instead of him,’” read a eulogy in Kayhan, the unofficial mouthpiece of Supreme Leader Ali Khamenei. Despite Shalmani’s senior position, his death was overshadowed by the viral photos of Iranian officer Mohsen Hojjaji’s capture and beheading by the so-called caliphate. Shalmani deployed more than 20 times to Iraq and Syria, according to an account published in IRGC-affiliated Mashregh News, since joining the Qods Force in 2004 or 2005. He “undertook matters related to” the US invasions of Iraq and Afghanistan in the 2000’s, according to Tasnim. That information has been removed in the updated article, indicating a cover-up effort. Indeed, Kayhan notes that Shalmani began “difficult missions” immediately after officer candidate school in 2007 or 2008. Shalmani reportedly deployed to Syria when “sedition” broke out in 2011, but the updated version said 2013 or 2014, suggesting another cover-up attempt. And interestingly, the original version said Shalmani in 2011 or early 2012 “had various responsibilities” and was “one of the commanders of the Heydarioun Base” [or Division] – the name of the Iranian-led Iraqi contingent in Syria. His experience in Iraq earlier would have qualified him to hold that command post upon initial deployment to Syria. In 2013 and early 2014, Shalmani was an operations commander in the siege of the Damascene East Ghouta suburb, according to Mashregh. Ghouta was the site of the infamous August 2013 chemical weapons attack. While in Syria, Shalmani was wounded in action several times. From its inception, the IRGC has sought to distinguish itself from other modern militaries by instilling a culture in which commanders fight at the front, thus increasing the risk of fatalities and injuries. After the Islamic State’s incursion in Iraq in 2014, Shalmani was “one of the first individuals who participated in the defense of Baghdad and Samarra with Hajj Qassem [Soleimani],” according to Tasnim. But by that time, the Iraqi army and counter-terrorism forces had blunted the advance of the Islamic State toward Baghdad. Iranian-led militias, however, played key roles then and since during the war against the so-called caliphate. Iranian commanders helped plan and lead operations shortly after the formation of the Popular Mobilization Forces (PMF). Shalmani participated in Iraq’s battles with the Islamic State for control of Ishaqi, al Dawar, Alam, Tikrit, Baiji and Makhoul heights, according to Mashregh. After recovering from another injury, Shalmani deployed yet again to Syria in 2015. The Tasnim account said Shalmani was promoted to the operations commander of the Heydarioun Base in that year. The Mashregh account confirmed that he held the position, but says that Shalmani was the base’s intelligence chief beginning in Aug. or Sept. 2016, and also operations chief from Dec. 2016 or Jan. 2017. Shalmani distinguished himself during the 2015 Operation Muharram, a large IRGC offensive launched in southern Aleppo province in coordination with Russia and Syria after the Kremlin’s intervention in the war. Then, he was an intelligence chief during last year’s conquer of Aleppo, according to Kayhan. Kayhan noted Shalmani was recently leading operations in “the deserts of Palmyra” and fasting in the scorching heat during Ramadan, which was between late May and June, after recovering from an injury sustained around April. Kayhan added that, in his last mission, Shalmani was in charge of the Ghassem-Abad Base that is stationed in the vicinity of Palmyra, and Tasnim said Shalmani led “seven or eight bases” and “several hundred combatants,” mostly Iraqis. He was setting up positions northeast of the American base of Tanf, and may have been involved in operations earlier in May and June that challenged the American presence there, which triggered US strikes. In one of the American attacks, the US struck the Seyyed al Shuhada Brigades, the same militia that Shalmani was later directly commanding. In his final mission, Shalmani led operations around Jamouna as a component of a broader mission to capture territory from the crumbling Islamic State. Driving home the message, an op-ed on Khamenei’s website this week said that capturing the Iraq-Syria border area “prevents America’s plan to divide the resistance’s eastern and western axes” and brings the oil and water-rich Euphrates Valley back to Damascus’s control. The Iranian accounts credited Shalmani with saving dozens of lives when the Islamic State ambushed positions before dawn in early August. More than 40 Iraqis and several Iranians died in the raid. As Shalmani oversaw withdrawal and held back the Islamic State’s onslaught, he was wounded, and later died on the way to a medical tent. Immediately after the attack, the IRGC accused the US of directly supporting the Islamic State to cover up for the stinging defeat. It vowed revenge for the death of Hojjaji. While it did not mention Shalmani, the IRGC certainly had that in mind. The IRGC has publicized drone campaign against the Islamic State in revenge for last month’s attack [See FDD’s Long War Journal report, The IRGC touts drone strikes against the Islamic State]. Shalmani is representative of the present generation of Qods Force field commanders who have fought in the Iraq and Afghanistan of the 2000s and the Syria and Iraq wars of the 2010s. The Qods Force, of course, continues to operate in other hot zones such as Afghanistan and Yemen, as well as elsewhere across the globe. Some of the rising officers have only experienced the 2010s conflicts. These cadres have taken over for the generation of field commanders whose formative years were in Iran-Iraq War of the 1980s and fought during the wars of the 2000s. The older generation holds the most senior positions in the Qods Force and the IRGC. The latest generations of battle-hardened officers are poised for more promotions in the force and the Islamic Republic. The human cost of military intervention is real and its forever. Hossein Qomi is gone for evermore. The human price of intervention for the Iranians, while costly, has been mitigated by the 2003-2011 work done by the USA military and state department and coalition partners. Iraq will be stabilized and be back in the Iranian pocket where it was put in 2003 with such a high cost in American life. Iran is one of the nations of the world that consider themselves to be exceptional. It is said they actually factor it into their military planning. I’m not sure how that might be done. The stories of heroism must match the level of his supposed exceptionalism . As I was reading the story of his demise, I thought for sure it would say they found him in his buckskin cap, surrounded by dead ISIS, him having clubbed them to death with his Kentucky long riffle before being bayoneted. Everyone back into the truck, the locals are going to stomp each other out. Time to cut-n-run like chicken dung.